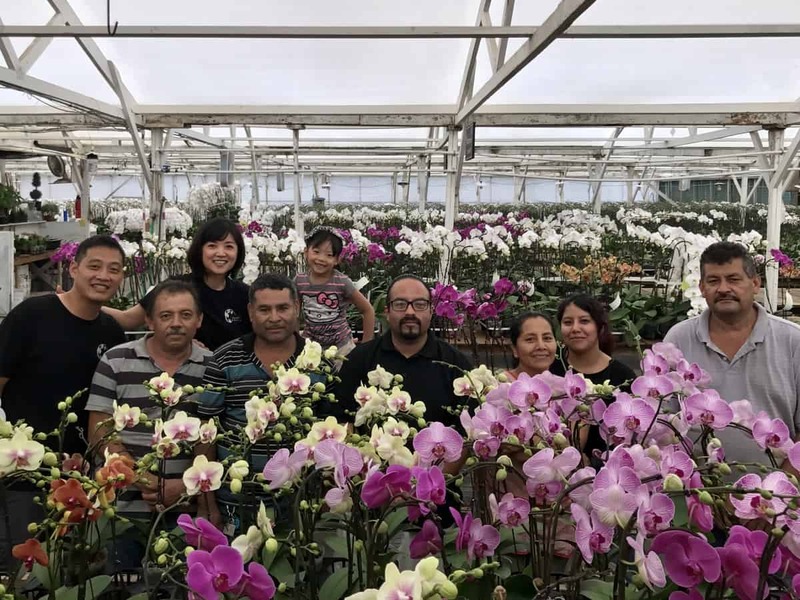 Meet two Southern California farmers who are passionate about providing customers with quality hydroponically grown vegetables and orchids. Luis Palacio, client relationship manager, and Endeavour Shen, general manager, share some of their thoughts on farming, advice for future farmers, and some of the incredibly generous ways they serve their community. Endeavour: I was in the accounting profession for 10 years. Before that I spent 4 years in the Navy and was given the opportunity to attend a course to learn hydroponic farming. I started out growing hydroponic basil for one customer. I rented space and set up the operation and when the owner decided to retire, I was given the opportunity to purchase the property in 2014. I found an investor that believed in my efforts to grow hydroponically. We have been selling our products at 3 farmers markets for 5 years. We are known for the consistency and quality of our product. Luis: We have routines but they are pretty loose. We check on the seedlings and tables and then we start harvesting for the markets. We have a group of tasks that we go through to monitor our systems. We have to be diligent and constantly check on and manage the growing systems. CA Grown: What are your favorite things about farming? Luis: Turning nothing into something. Start out with a seed and follow steps and it turns into a flower or food. Endeavour: Every day you do what you can do keep the green house running efficiently. It’s beautiful to see a seed grow into a living food with different tastes and textures. Luis: The appeal of growing a product and being active and outside. Endeavour: Producing a natural product that people would enjoy. Customer satisfaction and having our customers tell us how much they enjoy our products is very rewarding. Setting up for farmers markets is a lot of work but it’s nice to have such close contact with our customers that keep coming back. We donate produce to a retirement community for their kitchen. I also lecture at Camp Pendleton to inform military that are about to leave the service on farming and how they might be able to get into the farming industry. We have an Orchid farm and we donate flowers to local churches. We are also going to be donating produce to the Wounded Warrior Project. We also do Farm tours for schools. Luis: I’ve been an avid skateboarder since I was 12. I’m very physical and enjoy outside activities like rock climbing and hiking. I also enjoy wood working and things that have to do with design. Endeavour– I have 2 small children that occupy most of my time. I love deep sea fishing but can only get away once or twice a year. My family is very involved in the farming operation. Luis/Endeavour: Because we farm hydroponically, water conservation is very important. We have 36,000 orchid plants and a 16,000 sq ft space. Not a drop of water goes to waste. We give our plants the best but we are very conservative in our use of water. We make it a priority to have minimum inputs to our products. Luis: Develop good habits and don’t be afraid of hard work and getting dirty. Endeavour – Lots of prayers. Farming is a life style and you deal with every aspect of the business. You need to solve problems every day and push through all the issues that come up daily. You have to be proactive every day. You need to have an entrepreneurial spirit to be a farmer.